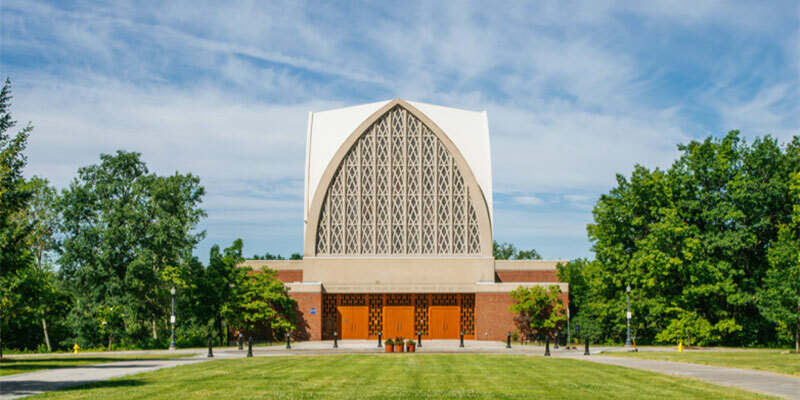 The University took a pioneering step forward when the Interfaith Chapel was built in 1970. At that time, few schools could boast a facility intended to be a religious gathering place for all people. The Interfaith Chapel is a place for people to worship in their particular faith and a place where people of different faiths, or no religious tradition at all, can share in dialogue, worship, and interfaith education. Our multi-faith community and our interfaith engagements contribute significantly to the rich diversity that is the University of Rochester experience. We welcome those who strongly identify with their religious tradition, those who are “spiritual but not religious,” and those who want no affiliation at all. The chapel is a place where students can connect, create community, join together in fun and service, learn about the faith of others, deepen their own faith, discuss the “Big Questions,” and explore their own values and identity. The Interfaith Chapel contributes to the mission of URI through its ongoing work for interreligious and interfaith cooperation and understanding, preparing our students to take their place as global citizens well-schooled in the nuances of interreligious and intercultural engagement. Through cooperative programs among the various religious communities affiliated with the Interfaith Chapel and through the activities of the Students’ Association for Interfaith Cooperation (SAIC), the Interfaith Chapel nurtures the spiritual growth and maturity of our students within their chosen religious or philosophical tradition. We also help students develop the critical global leadership skills that they will need as they enter the professional world. In addition to the large, street-level sanctuary, on two more floors we have two kitchens, the Brennan Room, a conference room, and a spacious river-level room for social gatherings, religious services, meals, and meetings. For those looking for a quiet, centering space, we have a small meditation room on the second level. The chapel has an indoor labyrinth that is open for meditative walking on the river level several times a month and gender specific ablution stations are available. The spacious building is equipped to meet the many different needs of individuals and groups. The director and the various chaplains and religious community leaders are here to serve students and other members of the University community in whatever ways are most helpful as spiritual and/or religious issues, questions, concerns or joys arise in the course of daily living.